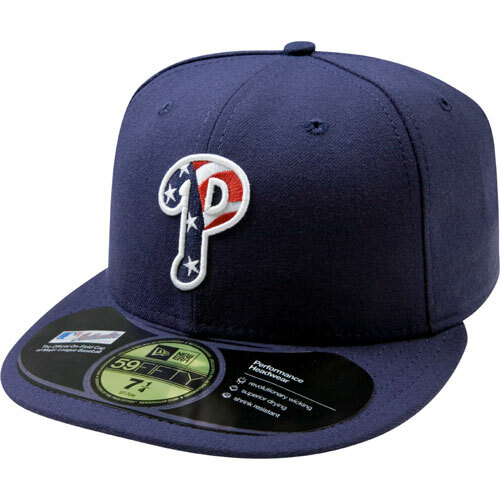 Check out the hat that the Philadelphia Phillies will be wearing over July 4th! Philadelphia freedom, I love-love-love you. Yes I do! Nevermind for now that many blue hats would say the same thing. â€œPink Hatâ€ has become synonymous with a certain gender (female) a certain age (young) and a certain type of fan (bandwagon). In fact, nowadays you donâ€™t even have to own a pink hat to be dismissed as a Pink Hat. Gentlemen, I know you hate sitting in front of a bunch of chicks knocking back six dollar beers, ogling Gabe Kapler, and ignoring the game. But puhleaseâ€”I have been sitting in front of frat guys doing the same thing for years (well, except for the Gabe Kapler part). Nowadays, these Bleacher Creatures seem to favor hats in St Patrickâ€™s Day green. Yet where is all the purist â€œitâ€™s not even a team colorâ€ moaning about the â€œGreen Hat Brigadeâ€? Yes, some female fans are unknowledgable bandwagon jumpers. But men, of course, have been lousy fans for years. There is one thing about the pink hats (and lavender jerseys, and sequined hoodies) that bothers meâ€”but itâ€™s not the women who wear them. The Red Sox can talk about â€œreaching out to female fansâ€ until they are blue (or pink) in the face, but it will just make me see red until I can buy a traditional shirt in size small. I know Iâ€™m not the only woman tired of â€œmediumsâ€ that reach to her knees. Aware of the frustration among female fans, baseball-obsessed actress Alyssa Milano recently unveiled a new line of baseball shirts for womenâ€”and promptly made the situation even more exasperating. In one publicity shot, Milano shows off what appears to be a Pittsburgh Pirates kimono, complete with yellow satin sash. In another, she displays a White Sox blouse so violently polka-dotted it makes the pixels on my laptop vibrate. The Yankees v-neck top appears to be see-through. This is my alternative to XXL windbreakers? Meanwhile, NASCAR plans to offer bikinis and stilettos to its female following. NFL fans can buy a Tom Brady jersey in â€œpeach,â€ Brian Urlacher in â€œcrocus,â€ or Jake Plummer in â€œguava.â€ (Call me a stickler, but shouldnâ€™t so-called â€œfashionâ€ jerseys for a fall sport at least come in fall colors?) And at the US Open, punditsâ€™ eyebrows raised and their tongues wagged about Maria Sharapovaâ€™s sparkly little black tennis dress, coupled with her â€œI feel prettyâ€ Nike ad. â€œItâ€™s okay to be fierce and competitive on the court and still have a feminine side off-court,â€ she explained. The 6â€™3â€ Siberian then proved you can win grand slams in sequins. Unfortunately, whether you can win respect in them is still an open question. As for the pink hats, I think Iâ€™ll passâ€”but not because of the backlash. Itâ€™s just that jungle camo really brings out my eyes. Yet you mock the camo hat, Coley. Whatever, vegetarian peacenik hippieman. I don’t know what my love of the freedom hat, as I have so dubbed it, has to do with my vegetarianism. Except that both make me irresistible to women. You’re right, Coley. Nothing like a delicious celery stick to rope in the ladies. You don’t win friends with salad, Ward. You win them with GUNS!!! Actually, I don’t really like celery. That, and coconut flesh (though I love coconut milk).